This page is designed to give the reader some basic information about Yant designs and their meanings. One of the most asked after things is a list of Yants and their meanings so it is for this reason that we have decided to put this page together. We hope it will give our readers the knowledge to select a Yant that is suitable for them. There are literally thousands of Yants, with all kinds of uses from making the baby sleep at nights to keeping unwanted spirits at bay. Protection against danger / illness / unwanted spirits / physical harm / spells. The circle at the bottom represents the life you live with the many earthly distractions we encounter in our daily lives. As long as you let these things control your life you will go around in circles. Get rid of these things and you will get on the ever decreasing spiral. The more you do this the better your life will be. The spiral represents the head where the brain is and where the decisions are made. Spirals around the crown of the scalp until it reaches the top center point of the scalp. The straight line pointing upwards, signifies the straight path to Nirvana or Buddhism true enlightenment without any wavering behavior that the Arahants (Enlightened Saints) have accomplished. Unaalome’s are used at the beginning of a Yant and at the end and also around many designs for decoration. Controls all other Yants from the neck down and by having this you show respect to the master and you become a disciple of that master if you wish. Gao Yord is normally the first Sak Yant design that is given to a follower of a Sak Yant master. 9 is an important number in Buddhism. The Buddha symbols are added to the Yant to give it more power. There is another name for this Yant, Yant Kru which means master Yant and controls all other Yants below the neck. Having the Goa Yord allows you to enter the lineage of the past masters that have been there before you and also become a disciple if you wish to do so. 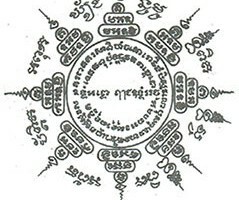 This is regarded as a powerful Sak Yant and will protect you in many ways. 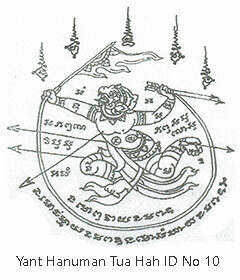 The Kata’s or Yants can be a combination of the Khom script inside the squares and only known by the original masters. I was with a master and he told me that in a square Yant design that there is 320 Yants in combinations and that’s why some Yant are so powerful. This Yant has 9 magical spells. 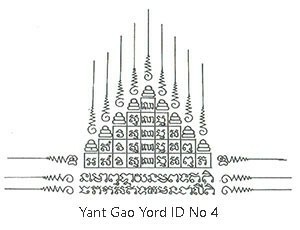 We have talked to our masters and been informed that this Yant has nothing to do with sacred mountings as some people believe. You read it on the internet and there is so much that is misleading. Maetda Maha Niyom: Will offer the bearer compassion and kindness in their dealings with others. This will increase popularity and others will be easily influenced by you. Maha Amnat: This offers the bearer power and authority in dealing with others. Awk Seuk: This will enable the bearer to fight adversity and to always fight for correct and noble reasons. Oopathae: This offers the bearer a smooth path in business activities. Kong Khra Pan: This offers the bearer magical powers of invincibility. Maha Lap: This will offer the bearer good fortune. 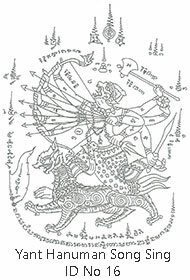 Bong Kan Antarai: This will offer the bearer protection against natural disasters, accidents and acts of violence toward the bearer. Natee Gan Gnan Dee: This will offer the bearer favourable circumstances in their work. Bong Kan Win Yan Chua Rai: This will offer the bearer protection against unwanted spirits. Maha Saneh: This will offer the bearer charm and appeal to others. Paed Tidt 8 directional Yant is a very interesting Sak Yant Thai tattoo. Many people like this one. 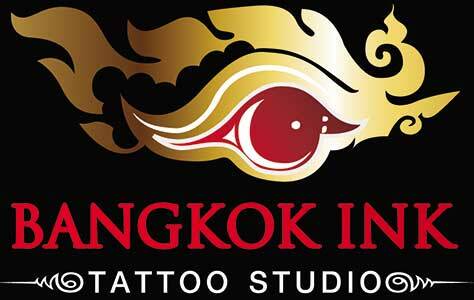 It has been done many times at Bangkok Ink and at our masters Sam Nak’s. The Yant is for pulling in good luck and protection from all 8 directions. This is an excellent tattoo with powerful Yants to help you in the future which is another form of travelling but has no compass directions. Do not limit your mind. Hanuman was a mythical monkey god in the time of Rama and according to legend, Hanuman was invincible and had powers far greater than humans, including the ability to fly. The ancient Thai epic story of Ramakian depicts Hanuman, the monkey god, who was said to be Rama’s strongest warrior. Even the Thai school curriculum includes stories about Hanuman and portrays him to be a god that leads a monkey army and their objective is to rid the world of evil spirits. His main traits were humility and bravery, he was looked upon as hope for humanity. He wasn’t a god but had managed to attain high levels of spirituality, like a deity, therefore demonstrating to man that a mortal being can in fact rise above the shallowness of our worldly plain.